We were finally able to clear the Knysna Heads at 13h00. The waves were breaking heavily and were 2.9 meters high. We chose our gap in the wave sets of 12, and slipped through without a splash on Catatude. With the hardest part behind us, we took to the sea and proceeded towards St Francis. The winds were a little too fair and we ended up motoring more than we would have liked too. 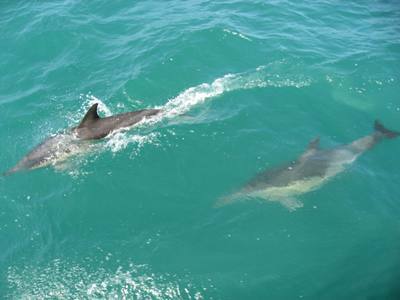 We all took this time to relax and take in the scenery, which included a huge pod of dolphin. The evening was uneventful, except for an excellent braai courtesy of Ryan. As our Radar is on the blink we decided to sail further away from the coastline than we initially intended to, which means clipping the edge of the current against us. Each of the four of us did a 3 hour shift. The Sat TV is wonderful when shifting alone, you get to watch a movie or the news inbetween looking into the black yonder for something. 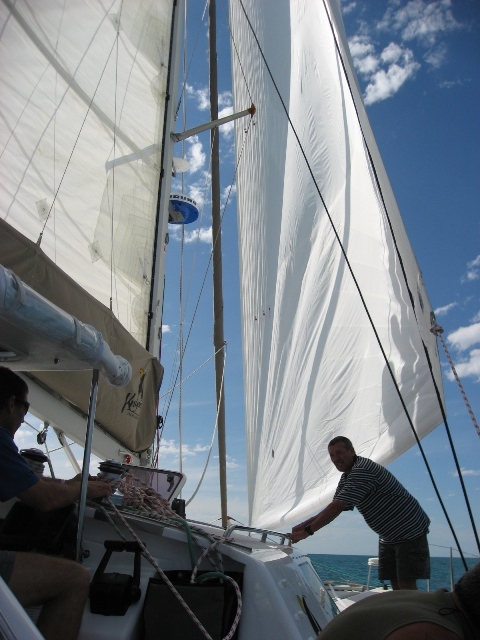 "Flying Genoa, wind keps changing"
We were greeted to a beautiful day with silky smooth water and a warm breeze. We spent the day fiddling with the electronics, eating, sleeping, reading and enjoying the warm sunshine. Everyone is out on deck like dassies. We have lost comms and sight of 'Jangles' who we have been sailing with. 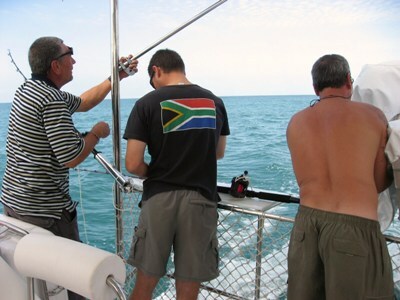 Regarding equipment, our sat phone is working beautifully and the broadband connection is excellent and very stable, however still no radar, and now the AIS (our transponder which tells other ships where we are and us where they are) is also not transmitting. The MaxSea software is pretty impressive. We are sailing close to the coastline (about 1 mile in) to try and avoid the Aughulas current which is running at +-2 knots in the opposite direction to us. "Smooth sailing, Im loving it"
Another good weather day. This is a far cry from our maiden voyage to Cape Town when we had our baptism of fire and we are extremely happy about warm weather especially since we hear that Joburg is suffering from the onset of winter. The winds were much better today and we had all types of sails up during the course of the day. We had quite a few visitors today, dolphin, whale, shark and sunfish. The fishing has not been going too well though, Pedro where are you? these boys need help. We are doing an average of 6 knots and are so close to the beach that we can see the bathers. 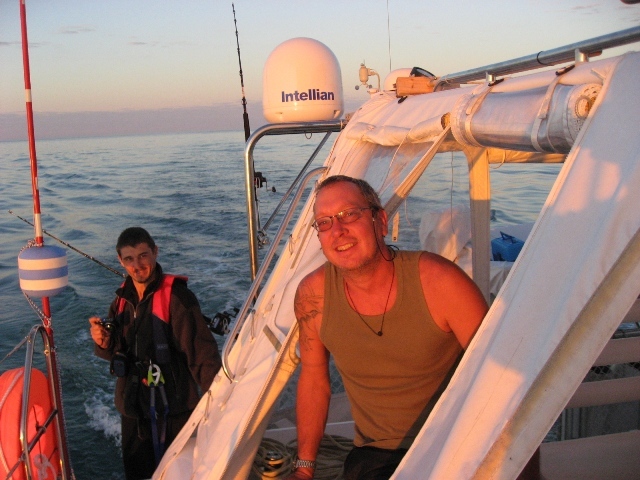 At the onset of evening we moved away from the coastline and kevin has managed to get the Radar and the AIS working. Yay, so much more comforting to see where the land is in the dark! 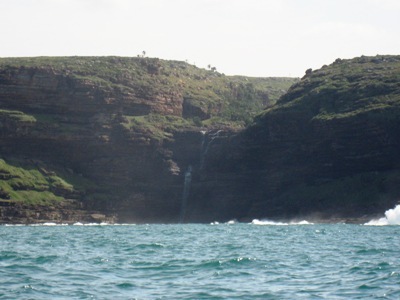 A great evening, along the wild coast and at first light we expect to be at Port St Johns. "Sea like glass, beautiful warm day"
Beautiful day, extra warm, not a cloud in sight and we have some useful wind. The watermaker is working like a champion so we can shower for as long as we like. Who can say they shower in bottled water ? That's essentially the same as our watermaker is giving us. And that from sea water. What a fantastic day weve had. Its been fun and hully gully all the way. 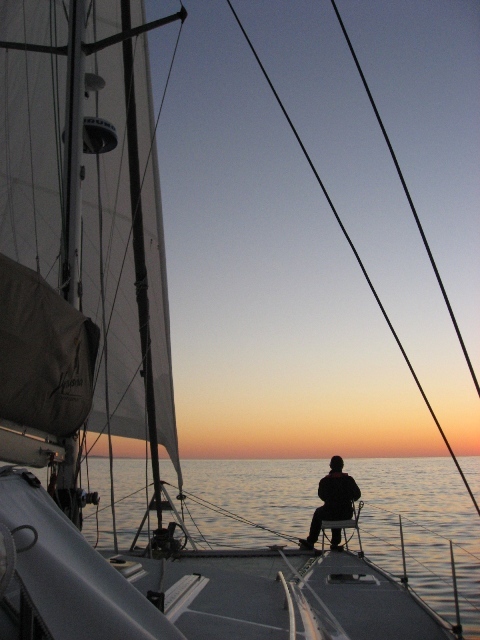 Some beautiful sailing, a bird rescue, constant companionship from the dolphins, fish strikes, false alarms and more. 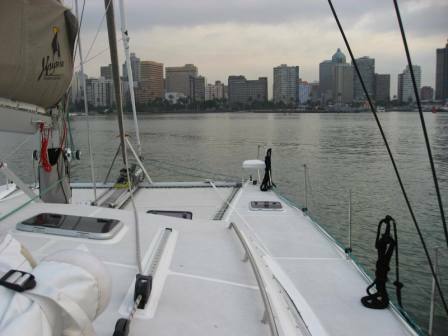 Today we covered 123 miles, and we estimate, at this rate, that we will be in Durban harbour by 8am tomorrow morning. Yes I know its slow but that's what sailings about. Its equivalent to driving at 11kms per hour! See how long it takes you to drive from Knysna to Durban at 11km/h ? Our equipment is holding up and no more niggly problems. The Man Overboard Wristbands (MOB) that we wear at night set off a high piercing alarm. When you suddenly hear the alarm you mentally take count of all the persons aboard, then start looking at what is setting the MOB alarm off. Its the sat phone thats triggering the signal ! Ryan caught a fish, which turned out to be a plastic hessian bag ! A bird dived our fishing lure, and so we had to stop and backtrack to save the poor fellow. The lure was in his wing, but luckily we managed to free it without getting bitten. Great jubilation when he flapped off, and flew away. Ryan is busy preparing dinner. Tonight we have a worsie and lamb chops. The braai is going and he is manning his braai post. 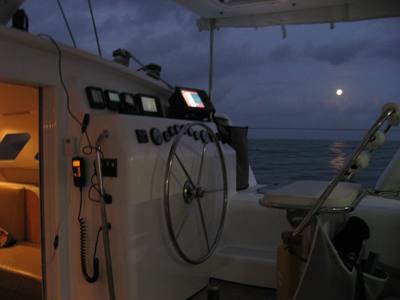 Everyone is in good spirits aboard, and the full moon is beautiful. "Did some pure sailing, GREAT"
My shift has been 9pm to midnight, that's if I manage to wake my relief in an hour or so. So when I eventually get to sleep it's precious. And today I was awoken at 6am to everyone's jubilation that Durban port was in view, and my valuable radio services were needed. My P.J. 's don't say 'grumpy but gorgeous' for nothing! 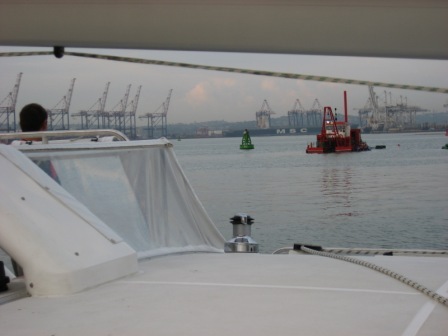 Durban port control was very accomodating and pleasant, and we passed the breakwater wall without incident. We entered the harbour at full speed with a burly 188m tanker hot on our heels. Grant, who owns 'Sea Flair' our sistership, kindly arranged a mooring for us and was at the jetty to greet us and welcome us to Durban. 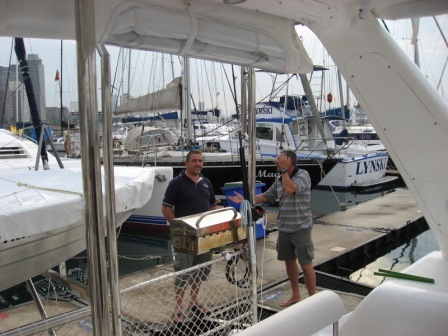 The annual Durban Boat Show is on this weekend, so we were happy to be in port early to avoid the water traffic that accompanied the show preparations. We headed straight to the club for breakfast and then the boat cleaning routine. "Too short, too quick, too bloody fantastic"
Well its terra firma for a while then on to Richards Bay, to provision Catatude for the East Coast of Africa trip. 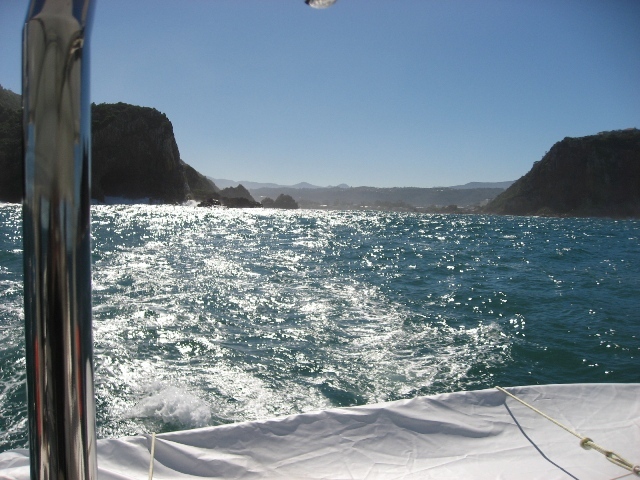 Lastly, just a massive thank you to all the wonderful people we met in Knysna. 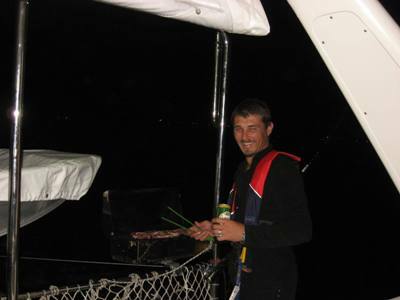 You made our stay more welcoming, comfortable and your help, advice, jetty braai's and friendships, will be missed by us both. I will update the photo gallery page tomorrow. Check back here around the end of May for our next leg news . . . .